I have been an avid Eric Clapton fan for more years than most. I have enjoyed his many twists and turns in his music, roots and his emotions. I don't really believe that any musician can relay their messages to the listener without their emotions at the surface. This brings a new level of reality to the music. Eric Clapton is no exception to the rule. He has always conveyed his life in his words through his music. Whether it be "Layla' "Wonderful Tonight" "Tears in Heaven" Back home is no different, it shows his enrichment in his life today that he has finally found him self spiritually, emotionally and with true inner peace and joy. As a father of four and reaching my 50's with children ranging from 6-21 I understand where he is coming from and get what he is conveying to his audience. There is a distinctive difference between hearing music and truly listening to it. In this new venture he has all of the right moves, you have to give it a chance and listen to each lyric, cord and tone you will not only know the music but you will feel the music and find your mood adjusting to each song. This is his best work since "Pilgrim" At first glance you tend to cringe a bit, but when you listen you are taken to where he is in that place in time that we all seek in our hearts. The love of family, love of children and the love of a partner that encompass your soul. I hope you experience the essence of Clapton in this music biography. Sorry but this album is a great disappointment to me. Only Ride The River and the George Harrison-song stick in my head after listening to it. The rest is very poor music to me. BACK HOME strikes me as a personal "Dear Melia" musical letter of love and appreciation. The lyrics clearly celebrate Eric's happiness with life and with his family. It's wonderful he can share this with us, and the album seems to invite us to reflect on and appreciate the value of our own relationships. I find the songs become more poignant each time I play them. I must say when I first played this album I was rather disappointed. Tracks such as "love don't love nobody" and "I'm Going Left" were, to me, the most disappointing. However, my favourite would be a toss up between "one track mind" and "love comes to everyone". A pleasing and long awaited comeback Eric, so keep up the good work! I've collected many Eric Clapton albums over the years, and I've learned what to expect from him and what not to. I don't expect him to release a predictable album, and I do expect him to release impeccably produced albums. To me, "Back Home" is an obvious labour of love, as well as a refreshingly positive album. I've listened to it repeatedly since my fiancé bought a copy of the dual-disc edition for my birthday. It's a wonderful gift, from her ... and Eric Clapton. Eric Clapton has 3 young girls now and the focal point of his life has changed. Eric's music has always reflected his personal life and this is no different. The biggest shock for me on this CD was the absence of blues. When I buy an Eric Clapton CD I expect to hear at least one blues song. The CD from the very start is well recorded and the sound is very good. Eric does things he has never done before like his version of the Spinners song "Love don't love nobody". He also does a reggae song called "Revolution" which does not appeal to me. But the good news is, there are some of his finest songs ever on this album. "One Track mind" is very catch and makes you want to get up and dance. If this wont get you dancing, not much will. To me the major find of the CD is the Ballad "Back Home". 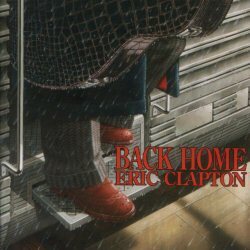 Back home is at least as good if not better than "Tears in Heaven" This could be the finest acoustic song of his career. Another song that will get your attention is the very laid back "Run home to Me" This is a very slow ballad in the vain of "River of Tears" or "Only the Broken Hearted". I'm So Tired" is fun to listen to and a great way to open the CD. This album is more consistent, and in my mind much better than Reptile was. Give this CD several listens before you make a judgement...........Not his best ever, but solid. The highlight to me is "One Day"; what a great song and what a powerful and emotional delivery! But there are several other nice tracks as well. Many of the songs are extremely catchy ("Revolution" maybe being the best example of this), I just can't get them out of my head! Not that I would want to. Well done, Eric! I'm looking forward to maybe hearing some of these songs in a live setting next year. I love this album! so many great songs - "So Tired" - a upbeat song with Eric singing about fatherhood, funny - "Love Don't Love Nobody" - a great song with good vocals and a great solo. "Love Comes To Everyone" - love the slide work by EC. "Run Home To Me" - reminds me of "River Of Tears". "Back Home" - acoustic work nicely done. Eric Clapton Is Still GOD! I love this new album so positive and with so much love and passion talking about the good things of life the simple ones... thanks again EC.